As a vegan, I think the question I get asked the most by non-vegans would have to be: “But isn’t it so hard?” My immediate response is a firm and confident: “Absolutely not!” Because guess what? It’s not difficult to eat real food. It’s actually much easier on your demeanor, your body, and your pocketbook. Which brings me to the second most common question: “Yeah, but it’s like crazy expensive right?” Well, yes and no. Yes, you can go to Whole Foods and spend your whole paycheck on ridiculous meat substitutes and faux cheese wannabes. That junk is expensive and just because it’s vegan doesn’t mean it’s good for you. It’s not my thing at all, but if that’s what you’re into, by all means have at it. This poor musician prefers the produce aisle where all the whole natural food hangs out. Those precious veggies are good for your mind, body, and soul. They can be transformed into the most decadent gourmet hors d’oeuvres or into your favorite comfort food dish that your mamma used to make, and they don’t break the bank! But can I tell you what my favorite thing about real whole vegan foods is? The ease of traveling. Like I said before, I’m a poor musician. I play slide guitar in two bands based out of Boise, Idaho: Sun Blood Stories and Ancient Psychic Tandem War Elephant. Being in two rock bands means a lot of touring and when you’re driving around the country, stuffed in the back seat of a car snuggling with a full drum kit, and spending all of your money on gas, hot meals can easily become a luxury one can’t afford. And if you’ve ever driven through a small rural town in the middle of nowhere, you know finding a fresh vegetable to gnaw on can be next to impossible. So I stock up. The night before we hit the road you can find me in my kitchen roasting broccoli and cauliflower, baking kale chips, putting together the ingredients for raw oatmeal, packing up some trail mix; you know, stuff I won’t have to cook, and because it’s vegan, it takes a long time for that stuff to go bad, even with no refrigeration. My favorite travel food whether I’m traveling with the bands or going camping with my friends, are these Miso-Tahini Tacos. I pack all the ingredients in their own little jars and when the tummy starts rumbling in the middle of nowhere: assemble, eat, repeat until full. Before we get to the tacos, I need to clear my conscience about this recipe. I shamefully ripped it off from a small burrito joint that used to be open in Boise, Idaho. The restaurant did not stay open for very long but it definitely wasn’t because of the food. I consider myself a lucky little vegan because I got a chance to eat there during the eatery’s short life. I had a black bean taco which wasn’t anything special but the taco came with a bomb sauce. When I asked what was in it, I was told the main ingredient was tahini (but that was all they were willing to reveal); so I created my own version. Because of how simple the prep and assembly is for this meal, it has become my go-to meal for traveling. If you’ve got access to something that can warm stuff up (i.e., a microwave, stove, the sun, etc), go ahead and warm up your tortillas. When you’re ready to eat, pile all that good stuff in the tortilla: black beans, cabbage, carrots, sunflower seeds, and anything else your little vegheart desires but make sure you leave room for the good stuff! Top your taco with the goods: as much sauce as you can get on there, sriracha for days (optional if you don’t dig the spice), and mounds of cilantro. Combine all ingredients together until they get saucy and then put them in “time-out” until you’re ready to eat. The longer they get to hang out together, the better the sauce will taste. Amber Pollard has been a “VegHead” for all 29 years of her life. 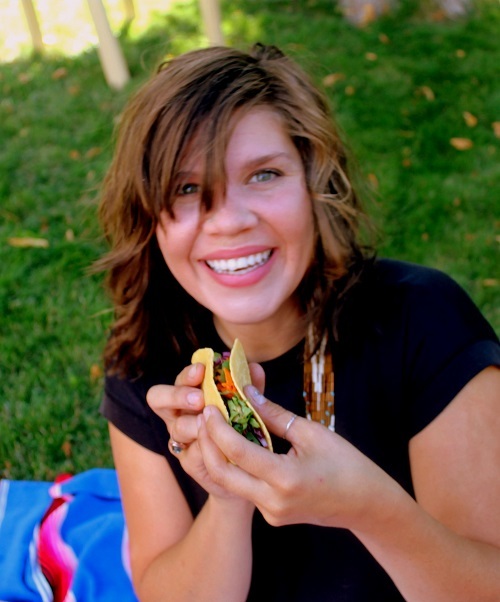 She considers herself a “foodie” and likes to show off her foodie skills at her blog Vegan4One. She is a mom, a musician, a certified nutritional consultant, an avid knitter, a marketing junkie, a notary public, and a happy-go-lucky Aquarius. She also secretly binge watches Grey’s Anatomy and Orange is the New Black, which she hopes is not a deal breaker. 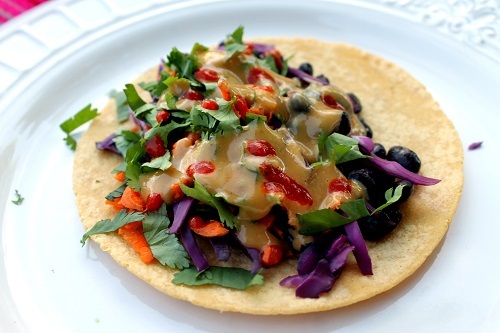 This entry was posted in Eat and tagged Eat, miso, recipe, taco, tahini, vegan. Bookmark the permalink.